Almotamar.net - A number of citizens were killed and others wounded in a series of air strikes by US-backed Saudi aggression warplanes on several governorates overnight, a military official said on Tuesday. 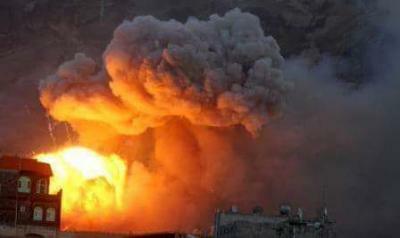 In the capital, Sanaa, the aggression fighter jets launched six strikes targeting al-Sobahah and Prophet Shuaib Mount in Bani Matar district west of the capital, while the other strike targeted Bani Hushish district and further two raids targeted al-Batnah and Bani Bariq areas in Nehm district northeast of Sanaa. In al-Hudaydah Red Sea governorate, the enemy warplanes targeted citizens` houses and oil station in Haise district and five other strikes several areas in al- Khawkhah district. Furthermore, the warplanes launched three strikes on the al-Hudaydah international air port and other raid on al-Salife area, where they destroyed telecom networks. In Jawf province, the planes struck the main road in al-Yatamah area of Khabu and Sha`af district. In Marib, the warplanes launched three strikes targeting Serwah district. Meanwhile, the Saudi-paid mercenaries fired missiles on citizens` houses in the same district. In Saada, the aggression warplanes waged two strikes on Takhyah area and al-Zamah in Bakim district, while other strikes hit Ghamer area in Razih district in the same province, killing six citizens and wounding several others. Meanwhile, two raids targeted Malahidh market in al-Dhaher district and another raid hit Tawailq area in Shada district, as well as the Saudi forces fired missiles on several border districts in Saada province, the official said. In Shabwa, the fighter jets launched a strike on Hajr Kuhlan area of Usylan district and another strike on Mablaqah area of Baihan district. In Dhamar province, the aggression warplanes launched 11 air strikes on Samah area and two strikes on Dhawran Anas district, setting many farms of fire as the Saudi Arabia seek to push Yemenis into starvation. In the province of Ibb, the war jets launched a strike on Muthalth Badan area, damaging resident's properties and houses. In Jizan region, the enemy jets launched two strikes on al-Dawd military Mount, the official added.